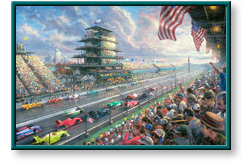 Indy Excitement, 100 Years of Racing at Indianapolis Motor Speedway, and other artwork by artist Thomas Kinkade can be viewed in our artist slideshow. Indy Excitement, 100 Years of Racing at Indianapolis Motor Speedway, by artist Thomas Kinkade and other Thomas Kincade art, art work, artwork, canvases, giclees, images, limited editions, open editions, paintings, paper, pictures, posters, and prints can all be found at Christ-Centered Art. "One hundred years have passed since the Indianapolis Motor Speedway opened its track in 1909. I can well remember the annual ritual of watching this famous race as a boy. Watching this famous race on the Wide World of Sports became an annual ritual. The names from the sport are legendary: A. J. Foyt, Parnelli Jones, Al Unser, Mario Andretti, Rick Mears and countless others. Little did I realize that many years later I would have the chance to meet these legends of racing and to commemorate the cathedral of speed where they became famous. "To create my tribute painting as the official artist for the Centennial Era of this famous speedway, I was allowed to take my sketching materials right onto the grounds of the track. I even got to set up and work at the famous brickyard starting line! "As I worked, I envisioned a crowd of cheering spectators from each of the generations that have embraced the track as an American icon. I even envisioned including famous cars from the golden age of racing in my painting. The finished work required countless studio hours, and an immense amount of final detailing. I hope you will join me in saluting the Indianapolis Motor Speedway as it celebrates 100 years of Indy Excitement." Indy Excitement by artist Thomas Kinkade as well as other open and limited edition inspirational paper art prints and canvases, giclees, images, lithographs, paintings, pictures, posters, and reproductions by renowned Lightpost Publishing, Media Arts, and The Thomas Kinkade Company artist Thomas Kincade can be viewed and purchased at special sale prices at Christ-Centered Art.